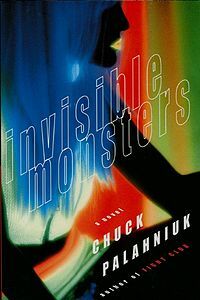 Retro Review: Chuck Palahniuk's "Invisible Monsters"
Home » books » retro review » review » Retro Review: Chuck Palahniuk's "Invisible Monsters"
Invisible Monsters is yet another weird and wonderful book from Chuck Palahniuk. Perhaps not quite on par with Survivor, which is far and away my favourite, this comes a close second. The book is narrated by Shannon McFarland, an ex-model who suffered major facial disfigurement in a mysterious shooting. She is unable to speak, having lost a significant portion of her jaw, and is invisible to virtually everyone she encounters. Rather than look on her hideous face, they prefer to ignore her existence. It is only when she meets the fabulous Brandy Alexander during speech therapy at the hospital, that Shannon begins a quest for her new future, which comprises robbery, revenge and a whole lot of drugs. Doubtless, the book explores the values we place on appearance, and our attitude to those who look different, but more importantly it considers what we consider femininity to be, with a rather heavy dose of Palahniuk irony come the end of the novel. As readers, we realise that these things—fashion, cosmetics—have really only served to make femininity a commodity that anyone can buy. As ever, Palahniuk doesn't shy away from some fairly difficult issues, and perhaps the best thing about Invisible Monsters is that it articulates the despair that comes from convention; Palahniuk’s characters all seek freedom from this, desperate to be original. This is satire at its best. A little research tells me that a new version of the book is being released this June, with extra material, so I may have to revisit the story again. Sounds great! Thanks for this review. Would love to borrow sometime if poss?